Built by Edward Hawker in 1900 and then called ‘Wachenappee’ after a tribe ‘of aborigines by whom Hawker was received in his youth. State heritage listed Olivet House, originally known as Wachenappee when built around 1900, is a magnificent mansion sitting on about 6,600 square metres of beautifully landscaped grounds in Stirling. A grand and elegant large family residence, the elaborately decorated formal entrance leads to equally formal sitting room and a dining room suitable for entertaining the corporate board. The garden features terraced hedging, many old mature trees, a tennis court, and is a delight to wander. 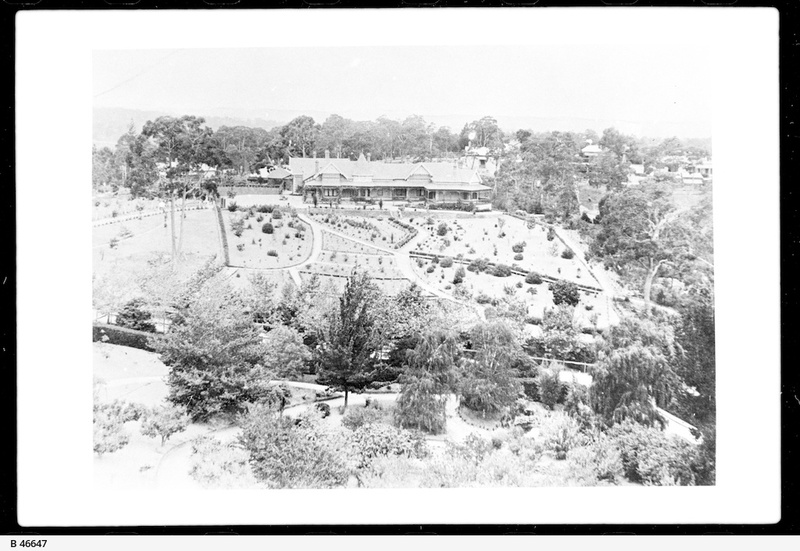 You can see a very early 1900 photo of the original landscaping here. …. I miss Stirling. My grandfather owned Olivet House for many years until it got too much for him. He and my aunt then bought Hathaway and lived there until their deaths. It was the only way they would be parted from the place. “Olivet House” is one of the states grand and elegant family residences, Circa 1920. Sold late 2012 for over $3 million. Sited on a substantial land holding of some 6,600 sqm approx (1 1/2 acres) of glorious botanical gardens that are beautifully terraced. 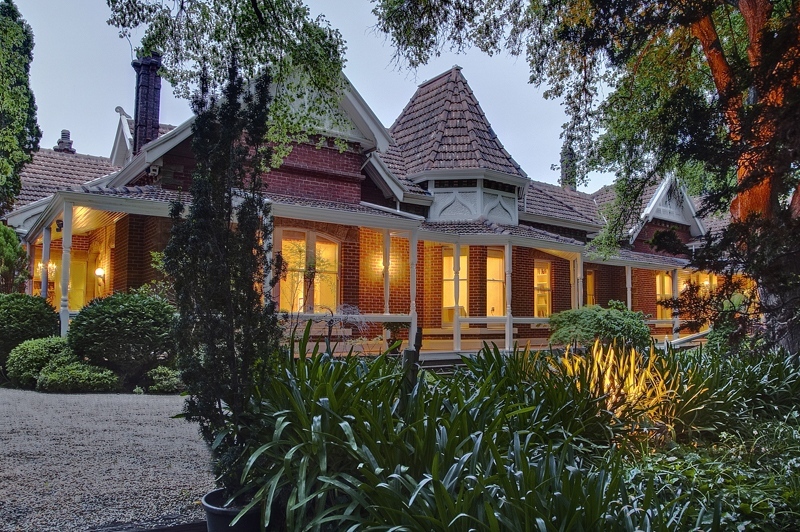 Comprising grand reception hallway, gallery size formal dining room, formal lounge room adjoins to spacious formal living room with open fire place, library. 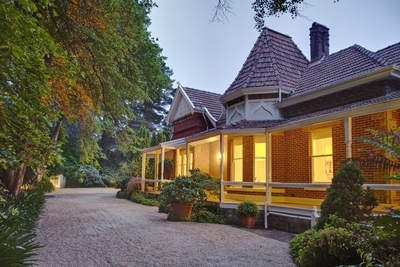 Extensive accommodation with up to seven bedrooms, two studies, five bathrooms, children’s rumpus room, tv room. Extravagant timber kitchen with large scullery and adjacent casual meals areas/breakfast room enjoying the morning sun. This family residence is breathtakingly elevated and balanced within the land with a most enviable garden setting to enjoy. The home is in immaculate condition with a tremendous amount of work being carried out over the years to preserve its inherent charm and grandeur. Following is a blog about this house in a country lane…. One of my favourite Hills houses has just come on the market. Olivet House c.1920 (formerly known as Wachenappee) sits in all its grandeur at the end of our street here in Stirling. For a while back in the ’90’s it was a very gracious Boutique hotel, but was converted back to a private residence by the present Owners. The land holding is a substantial 6,600 sq. metres approx (1.5 acres) of fabulous Hills garden & the house sits in a wonderful elevated position. Very nice hedged courtyard outside the back door. It has all the accoutrements required of a country estate. The stairs leading down to an all-weather (synthetic grass) tennis court (puts our dodgy old clay court to shame!!). Fabulous mature trees throughout the garden. Meandering paths lined with the traditional Hills camelias & rhodies. And a wide verandah to yell instructions to the gardeners from. However, as we wander inside things sort of turn pear-shaped. A strange combo. of marbled colour washes on the walls, skirting boards & dado line. I have no doubt that a large amount of money was spent in the ’90’s getting all these specialist painted finishes done, but I reckon they detract from the true ‘personality’ of the house. The formal sitting room is OK. I feel a refit coming on here in the kitchen. And the casual meals area off the kitchen has great potential. Love those French doors leading out to the verandah. The formal lounge room has a bank of fabulous windows, but more of that painted marbled wash-ie thing happening with the walls. There are 7 bedrooms, and here’s where the frills really kick in. More frills & garlanded friezes. This is one of the 5 bathrooms, & the ultimate awful frilly Austrian blind thing is in situ. This is a magical property, & I’m sure with a little clever design, strict adherence to the Less Is More theory, a large skip bin, the phone #’s of Heckle & Jeckle (aka Mike & Chris our favourite Painters & Decorators) & a fat cheque book, the new Owners can end the Frills & Friezes era Olivet House is sadly stuck in – good luck! Estimated sale price is $3 – 3.5 m.